Vitebsk took a special place in the heart of the artist. Here the birthplace of Marc Chagall, with this place he compared the numerous cities where the master lived. Confirmation to this is an open letter, which Chagall wrote in 1944, dedicated to Vitebsk. 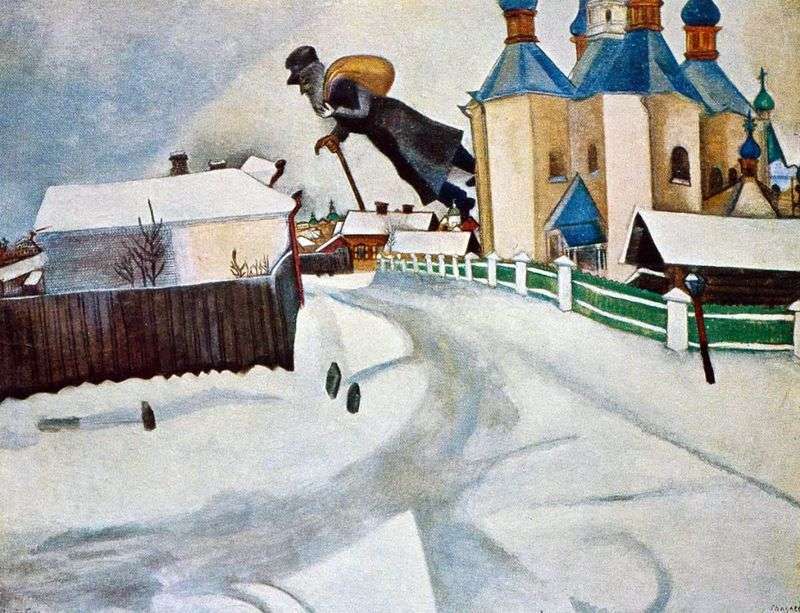 The artist who lives in these years in America, assures the road Vitebsk, that only with thoughts of him, Chagall the wanderer lived and breathed all these years. The painting “Above Vitebsk” is different in color and composition. There are no familiar metaphors and psychological overtones. The work looks quite realistic – the city’s straight streets, swept up by snow, low houses with flat roofs, neat fences. Only the Orthodox Church stands out against the background of this well-adjusted landscape. High walls of bright yellow color, crowned with domes, make the viewer pay attention to himself. And because of these walls we see the figure of a man – a long beard, a curved stick in his hands and a sack behind him tells us that we are a stranger. Critics often say that in this way Marc Chagall portrayed himself. He happened to live and work in different countries, so he was with a bag, but he always was with his thoughts, and so he hovers over the city. The picture, though executed in light colors, still allows you to feel the anguish of the author in a distant homeland. Description and meaning of the painting Above the Vitebsk by Marc Chagall.